Do I drive my own sled? How fast does a dogsled go? Find out here. Dog sledding is a unique experience, and one of our most popular winter activities. 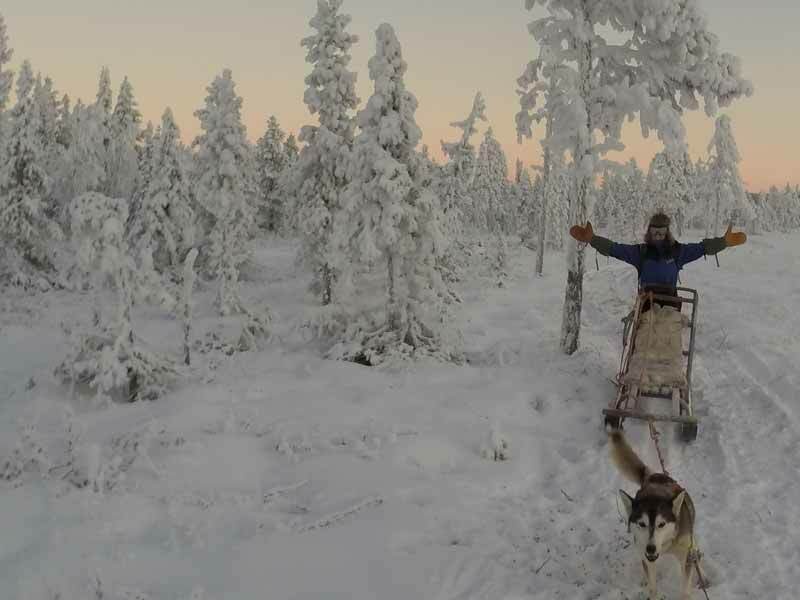 We've collected the answers to questions our clients commonly ask about our range of dog sledding holidays in Sweden, Norway and Finland. Whether you are an experienced musher or a novice yet to discover the thrills and adventure of dog sledding, we hope that you will find the information helpful to give you an idea of what to expect from your mushing holiday. How many dogs are there in a dogsled team? Do novice mushers get to actually control the sled dogs? How fast does a dogsled go? 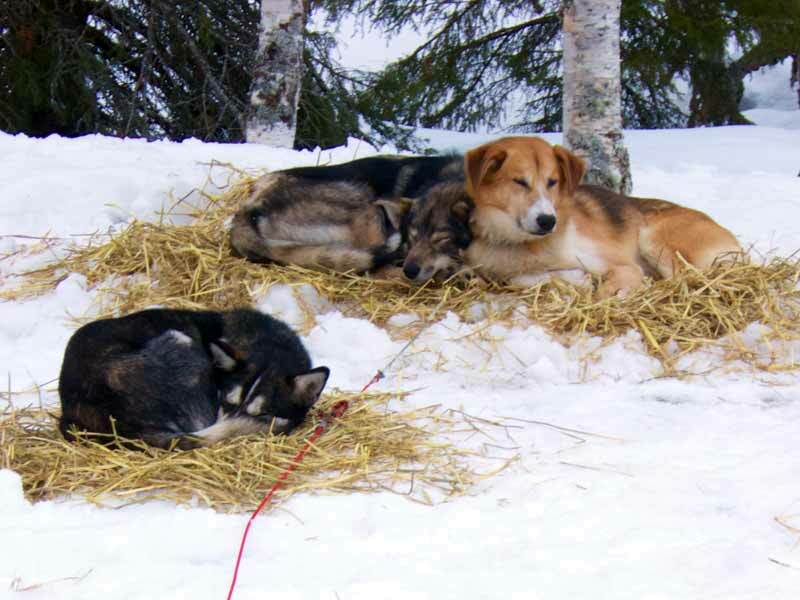 What happens on a "typical" day on a hut-to-hut or winter camping dog sledding tour? What kind of distance would you expect to cover in a day of dog sledding? What is the accommodation like on a multi-day dog sledding tour? I'm a solo traveller. Can I go dog sledding? How many people will be in the group during my dog sledding tour? What nationalities/age ranges will be in my group? Do I need to be particularly fit or strong to go dog sledding? What clothing will I need to go dog sledding? Where are the best places to go dog sledding? 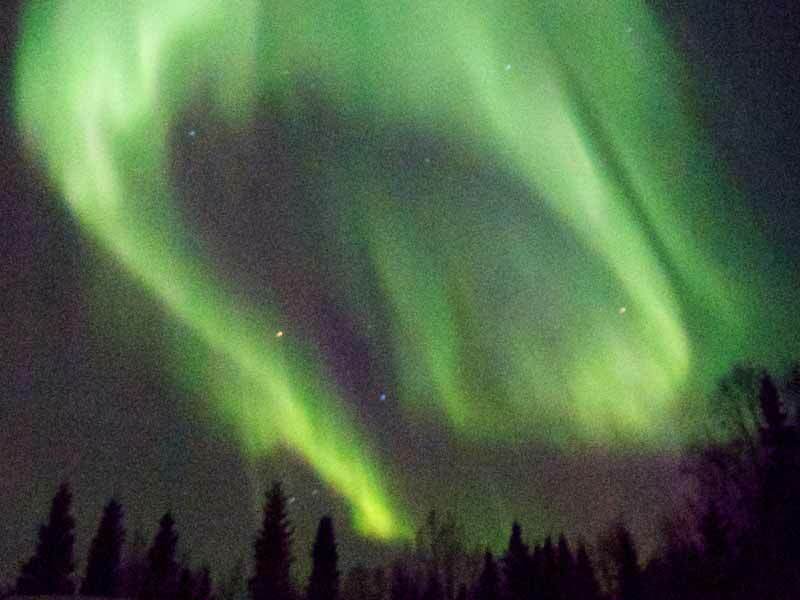 Will I see the Northern Lights during my dogsled tour? What is the best time of year to go dog sledding in Sweden, Norway or Finland? If you are driving your own sled, you will normally have 3-5 huskies in your dogsled team. This varies depending on factors such as the particular dogs used, the nature of the tour/terrain, trail conditions, and the weight of individual participants. Yes, they do. All our tours are based on adult participants driving their own sled*. Full instruction will be given from an experienced and knowledgeable local guide and help and advice is always on hand. 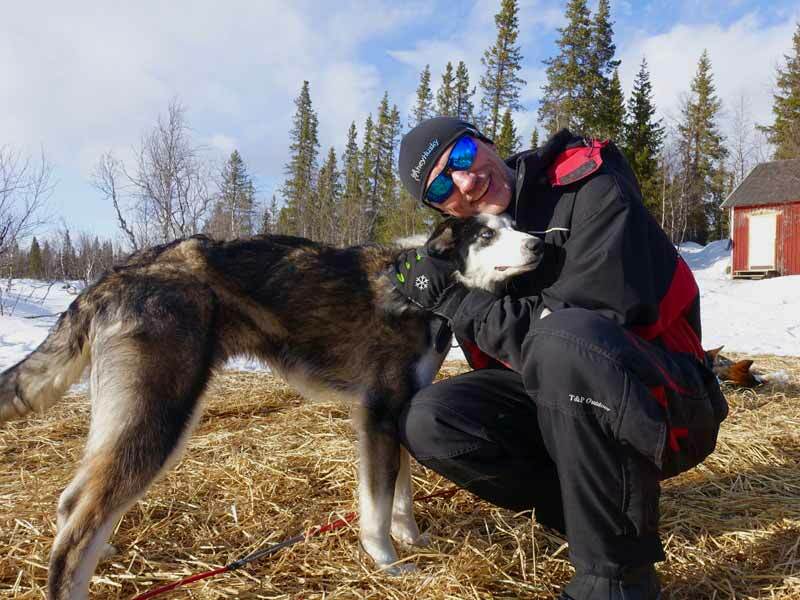 Usually people become quite confident at handling the sled and the dogs within a day and you should be surprised how quickly you relax and gain confidence. * For One-day and Overnight Husky Tours in Kiruna, there is the option to drive own sled or share one per two persons. For Private Dogsled Tours for Two in the Taiga Forest, the tour normally begins with your guide driving the sled and progresses to guests driving own sled shared one per two persons. For information on dog sledding for families and possibilities for children to drive, please see information on the relevant tour page. For some tours, such as Discover Dog Sledding, adult guests can choose to share a sled if they prefer. This depends on snow consistency, weather conditions, the weight carried and of course whether the sled is travelling up or downhill, but generally around 10-15km/hour. Again, this depends on snow conditions, weather and type of terrain. On a normal dog sledding day during an extended tour you will get up, make a fire, heat water for the dogs, go out and feed the dogs and clear the dog toilet waste. Then you have breakfast, pack everything together, clean out the cabin or break camp, load the sleds and start the journey for the day. During the day, you will stop to have lunch outdoors along the way, perhaps preparing lunch over an open fire. When you reach your destination for the day, you will prepare the dogs for the night. Exact procedure for this will vary depending on the tour and on the weather, but will often involve putting the dogs on a long wire and if necessary digging a wall of snow for the dogs to protect them from the wind. Depending on facilities and your accommodation for the night, you may need to melt water for the dogs to drink. After feeding and seeing to the dogs, it's time to relax and enjoy your evening - reflecting on the day's adventures with your fellow mushers, preparing and cooking dinner together and maybe even taking a sauna to soothe those tired muscles! Distance covered varies considerably depending on a number of factors, such as terrain, the weight carried in the sleds, weather conditions, snow consistency and your planned route. Available daylight hours also vary of course depending on the time you wish to go (darkest in November December getting gradually lighter until the end of the dog sledding season). Typical distance covered is normally around 20-50km per day depending on the terrain. Accommodation varies depending on the tour - please see the information for your chosen tour for details - but in general will be either in simple cabins, winter camping or a combination of the two. Sauna facilities may be available at some locations. For all multi-day point-to-point cabin tours, sleeping accommodation while out on the tour will always be shared in simple but cosy wilderness cabins (accommodation at the start/end near the kennels may be private - see tour information for details). 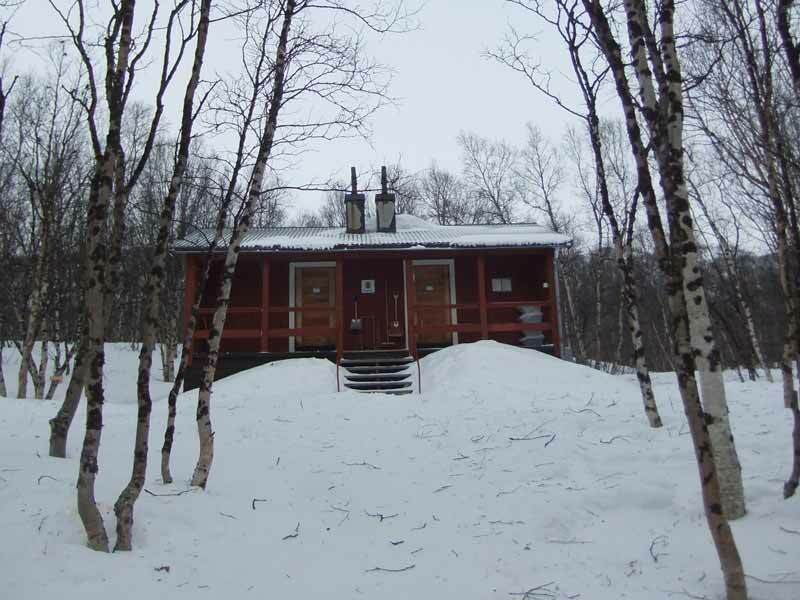 Cabins along the route will normally have shared sleeping rooms with bunk beds and facilities for cooking. Many cabins do not have electricity or running water - this is very much part of the wilderness experience - and everyone assists with tasks such as fetching water, chopping wood, and assisting with cooking/washing up, etc. For some tours, accommodation is wild winter camping along the way - a unique and challenging experience! Absolutely! Dog sledding is very popular with solo travellers and all our tours* are ideal for those travelling solo. As sleeping accommodation is shared, there is no single supplement for solo travellers. Exact group composition will of course vary, but a typical dogsled group will often consist of a mix of solo travellers and guests travelling with one or more travel partners. * with the exception of Private Dogsled Tours for Two in the Taiga Forest, which as the name suggests is intended for guests travelling with a partner or friend. For our scheduled tours, there is a maximum of 2-8 participants depending on the tour - see tour information for details. 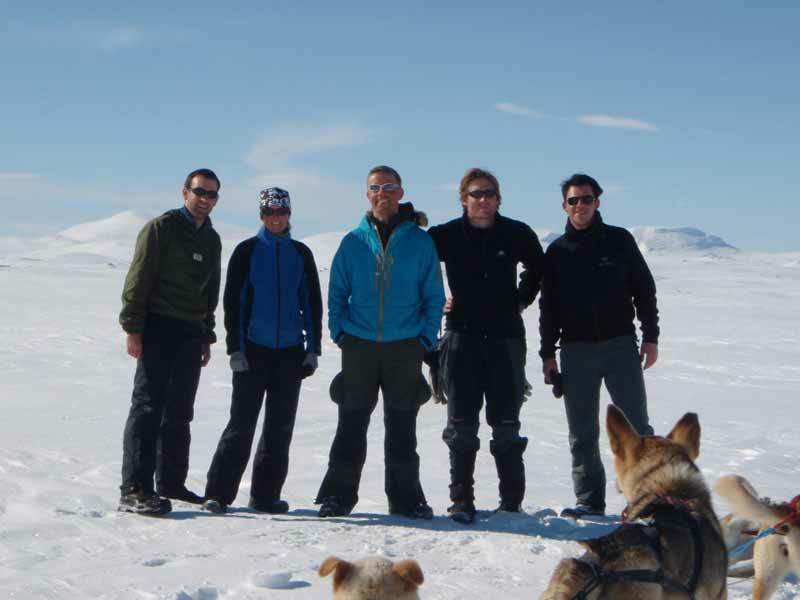 Some of our experiences, such as Northern Lights Dog Sledding in Lapland and Husky Mountain Expedition in Lapland are also ideal for larger groups, for example for Armed Forces adventurous training expeditions (groups larger than 8 persons will normally be divided into smaller groups to follow parallel itineraries, both for safety reasons and to maintain the quality of the experience). Our dogsled tours are open to guests from all over the world. Group composition will of course vary, but guests will often be a mix of nationalities such as UK, mainland European and participants from further afield such as Australia and the US. All guides will speak English and English is widely spoken to a high standard throughout the Nordic countries. Age ranges will vary depending on the tour - see tour information for details and min. age requirements. For tours intended for adult participants, typical age range would normally be from early 20s to late 50s, though we have had many guests in their 60s and even 70s participating very successfully in even some of our most challenging tours. We offer a wide range of dogsled tours from accessible to very challenging - please see tour information for your chosen tour for details. For all tours, you should be in generally good health and enjoy the outdoors, as well as be comfortable living in close proximity with others. Some strength is required, particularly when braking the sled when travelling downhill (this is very important, as a poorly-controlled sled can overtake and injure the dogs) or assisting your team when travelling uphill. Apart from One-day and Overnight Dogsled Tours in Kiruna and Discover Dog Sledding in Lapland, which are ideal for a family-friendly dogsled tour, in general dog sledding is not suitable for younger children, though for private tours it is often possible to accommodate younger children than on scheduled tours. Please see the information for your chosen tour for details of age limits and other requirements. There is no fixed upper age limit - a number of clients in their 60s or above have participated very successfully in challenging extended tours, and the most important thing is a willingness to get involved and work with the sled and dogs. It is of course important that you are comfortable with the physical demands of your chosen tour - if you have any questions or concerns, please don't hesitate to ask and we will be very happy to discuss the most suitable option for you. Note that the level of challenge of any tour will be significantly affected by weather and snow conditions - sledding on hard-packed snow under clear blue skies is much less physically challenging than sledding in fresh, deep snow in a blizzard! For all our dog sledding holidays in Sweden, Norway or Finland, specialist winter outer clothing you will need for your tour is included, which normally consists of warm outer layer (in many cases a snowmobile suit), warm boots, hat and gloves. Clothing provided varies slightly depending on the tour - see tour information for details. Participants will normally need to bring only their own base and mid-layer clothing. A detailed recommended packing list will be included in your booking documentation. Closest to your body an inner layer that transports humidity away from the body, such as a woollen base layer top and long-johns. Then a second layer that keeps in the warmth your body generates and absorbs the humidity from the inner layer, such as a fleece or jumper. The outer layer should protect you from weather and wind and be wind- and waterproof. This clothing is provided as standard. You should also have something to cover your face, such as a scarf or Buff, and ski glasses or goggles to protect your eyes and improve vision. Do not use cotton on the inner layers closest to your body, as cotton collects the humidity your body generates. The clothing gets heavy and chills you. Better materials to use are synthetics, wool etc. Sweden, Norway and Finland of course! In Sweden, our dog sledding experiences take place in the north of the country, in Swedish Lapland. In Norway, we offer options in central Norway, northern Norway and 500 miles north of the Norwegian mainland, on Spitsbergen! In Finland, our tours take place in the east of the country near the Russian border. All these regions offer wonderful opportunities for dog sledding. Landscapes vary from frozen lakes and forest to tundra to stunning mountain areas. 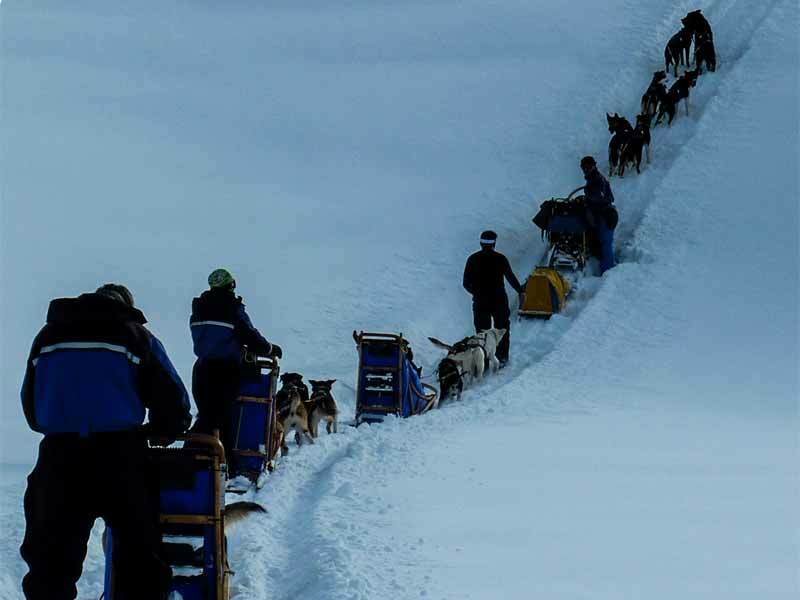 See our article comparing our range of dogsled tours for more information. Whichever region you choose, you will find dog sledding is an unforgettable experience. The Northern Lights, or Aurora Borealis, is a natural phenomenon, and so of course displays can never be guaranteed - but we hope you will! In general, the best chances for displays of the Northern Lights are, as the name suggests, in the far north, close to or inside the Arctic Circle, though displays do also occasionally occur further south. Displays can be seen in the far north from late Autumn to around early April. Many guests travelling with for dog sledding have an interest in the Northern Lights. However, we recommend that you see the excitement of the activity and the beauty of the landscapes as the main motivation for travelling and regard a display of the Northern Lights as a bonus. Even in areas with excellent chances, it is possible that it will be cloudy, there will be no activity, or (very common) you will be fast asleep after a long day of mushing adventure! For this reason, we strongly recommend that you also consider our tour options located in areas not normally within the "Northern Lights zone". These areas offer fantastic possibilities for dog sledding, beautiful scenery, and may even be quicker or more affordable to travel to than locations further north. This depends very much on personal taste and what you are looking for from your dog sledding holiday. 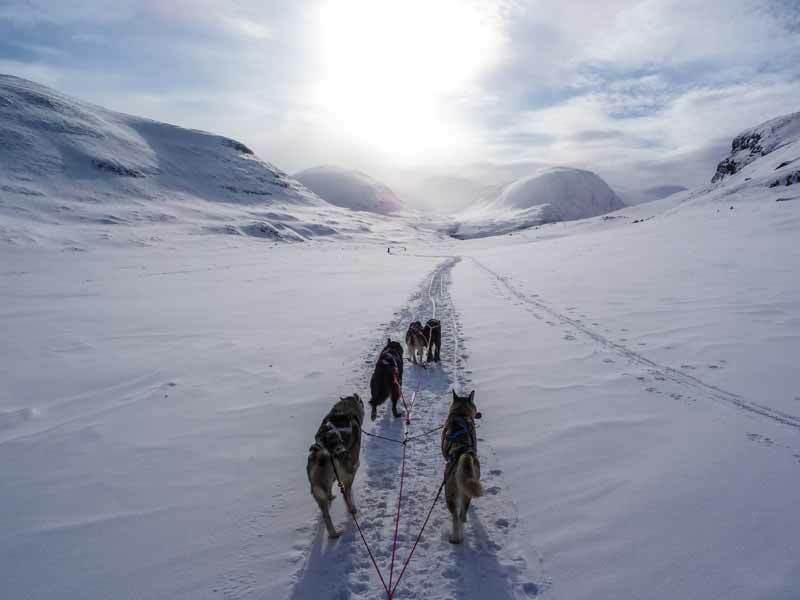 Certain tours (such as Husky Mountain Expedition in Lapland) are only available later in the season when weather conditions are suitable for dog sledding in the mountains, while others (such as Aurora Husky Adventure in Finnmark) are offered throughout the season. December and January are deep winter, when hours of daylight are shortest and temperatures tend to be lowest, but this time of year has a magical atmosphere and a special blue quality to the light. Later in the season towards March and April, the days are lengthening and the mountains have the "best of both worlds", with good snow cover but also the warming rays of the spring sunshine. Read our article on when to go dog sledding for more information. Browse our full range of dog sledding holidays in Sweden, Finland and Norway.